When Lucy wins a place at university, she thinks London will unlock her future. Having grown up seemingly a world away, in working-class Sunderland, London is a city alive with pop up bars and neon lights. Yet Lucy’s transition to a new life is more overwhelming than she could have expected. As she works long shifts to make ends meet and navigates her social life, she still feels an outsider among her peers. When things come to a head at her graduation, Lucy takes off for her late Grandfather’s house in Ireland. Seeking solace in the isolated cottage and the wild landscape that surrounds it, she wonders if she can piece together who she really is. How did you feel about the North of England as a creative space when you were growing up? How did you come to your interest in writing and did you feel that you inspired by the place you were writing in? As an adult who moved away, there are so many things I love about the North of England. The fields and the pubs and the low, heavy skies. The sense of camaraderie and a feeling that I might belong somewhere. I can see these things very clearly now, but when I was growing up I felt a kind of hopelessness – as though I was far away from everything and would never get out. I felt close to an edge; in a way that was wild and exciting but vulnerable, too. I went to youth theatre at Washington Arts Centre, where I made lifelong friends. We all still believe that drama club saved us. While our peers were drinking cider on Washy Viaduct, we were learning Shakespeare and discovering worlds that were different to the one we lived in. Music was also a huge influence. Bands from all over the world played in Newcastle and gigs were a space for the unknown, or potential – a feeling of another way of being opening up. The Baltic in Newcastle was big for me, too. It was my first real encounter with contemporary art and walking around it gave me a clean, staticky feeling, like being on a different wavelength. All of the books, films and music I was into told me that I had to leave the North East and go to London, which was the centre of everything. I did that – and it was difficult – and now I know that those books and films weren’t telling the whole truth. I wrote Saltwater because leaving the North East taught me the value of it. I felt that the lives of my mam and dad and my friends were full of poetry and power, but were never represented in art. I hope that teenagers from the North might read my book and feel a sense of potential. In terms of place, Saltwater primarily takes place in three locations: Sunderland, London, Donegal. Each of these seemed like a liminal space for Lucy, a place to transition into a new part of her life. Could you talk a bit about place in the novel? Lucy is drawn to liminal places because they reflect her feeling of being ‘in between’. She grows up working-class, but goes to an elite university and meets people who explode her sense of identity. She is caught in a constant push-and-pull between escaping her roots and returning to them. She goes to Ireland, where her grandfather is from, to try and understand herself and her history. She feels small and vulnerable and powerless in the face of structures that are so much larger than she is, but she refuses to be pushed out. There is a conflict between the transformative power of place – the idea that you can move somewhere new and become a different person – and place as a site of history, lineage and return. Lucy is caught between different worlds and trying to find a place to belong, but she learns that she can carve out a space for herself, even as the world tries to tell her she does not deserve one. How much of the central character of Lucy comes from yourself or your own experiences? Did you find it easy to write Lucy, or was it ever difficult to keep her character distinct from your own? Lucy is a version of me, but she isn’t me. Writing a novel, as opposed to memoir, gave me an opportunity to write about my own experiences (place, class, alcoholism, deafness) but it also gave me the power to construct a narrative, curate themes and define myself and my story on my own terms. I avoided Lucy’s story for a while, by writing short stories or different versions of Saltwater with similar themes and different characters or a third person narrator, but they didn’t really work. I realised that I was trying to distance myself from my own experiences – because I felt like they were silly and uninteresting – and because I was scared. I realised the importance of writing from a young, female, working-class perspective and addressing the ways in which I wanted to escape her. The character I was trying to avoid was the most interesting, and her life was the closest to mine. I was guarded about the autobiographical elements of the book for a while, but I think that the aim of writing is to open and deepen conversations about particular issues. I think I would be doing myself an injustice if I pretended that certain elements of the story were not true. The question of women and autobiographical writing is a big one at the moment, but I think it is important we recognise that people of all genders write from experience, and that all of those experiences are valid and deserving of literature. As well as writing your novel, you also write poetry. How do you find the process of writing in the two different forms? Your prose is very poetic: do you find that you set out to write one or the other explicitly or that they can inform each other? Poetry and prose are inextricable to me. I write prose in a ‘poetry’ headspace, which is similar to the feeling I described in The Baltic as a teenager. My work is influenced by visual art and music, too – I make mood boards and playlists. A friend once described film to me as ‘an emotional space for people to enter’ and I think that’s what all art is, really. A poem is an emotional space with more intensity and I’m interested in what happens when that emotional intensity is translated to prose. My writing is concerned with the body and the fractured or fragmented nature of poetry feels like the closest way to write about it. Poetry hints at a space beyond language, which, to me, is where bodies are located. You’ve written about your own experience as working class, and you also co-run a literary magazine The Grapevine, which aims to give a platform to under-represented writers. How did you find your journey to publication as a working class writer? I am the first person in my family to go to university. I did a BA in English Literature at King’s College London, but I found it difficult to connect with the texts we studied. I didn’t know how to write academic essays and I felt too ashamed to ask for help. I worked in lots of East London pubs where I met artists and musicians and they opened my mind in a different way. My university friends did internships at magazines and got jobs in journalism and publishing, but I didn’t really know how to go about that. I hadn’t ever thought about life beyond university – just being there seemed like a huge achievement. I wrote awful poems in the afternoons, before my shift at the pub. I decided to do an MA in Creative Writing, not because I was thinking about a career, but because it was the thing I loved most. The course was in Paris and I taught English in the mornings, cycled to my seminar, collected 3 children from school and looked after them for a few hours, then cycled across the city to cook dinner and read bedtime stories for 2 others. I lived in the old servant’s quarters of a tall building and there was no shower, so I had to wash in the swimming pool down the road. After my MA, I moved back to London, and worked in bars and cafes again. My grandad died and left his house in rural Donegal empty, so I decided to go and live there and write for a few months – as I wouldn’t have to work to pay rent. I tutored a local student and lived on €20 a week for 8 months – and finished my novel. I find the publishing world a bit daunting because I don’t know much about professionalism or careers. I have a lot of guilt and anxiety about money, and I’m always battling against a fear of being undeserving, but I also know I have a rare and important opportunity to articulate my experiences, which is empowering. I hope that my book might make other young, working-class women feel that they are not alone. I suppose I’m still searching for that community, through writing the book I wish I had been able to read. 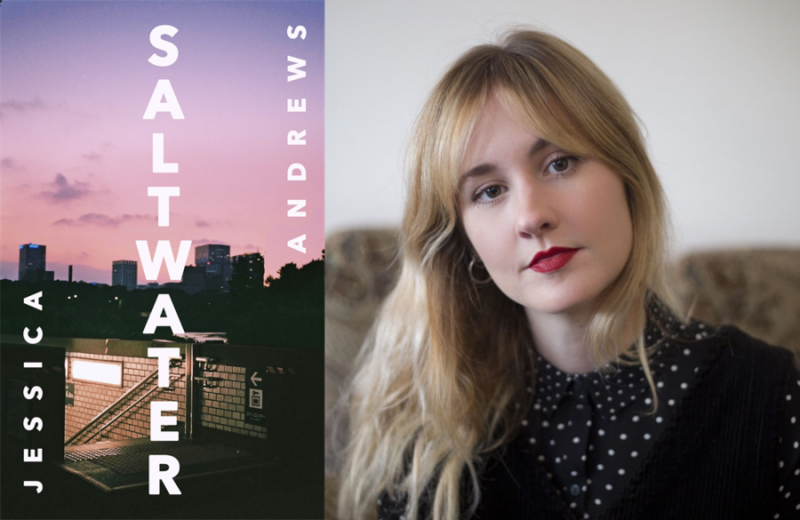 Saltwater will be published by Sceptre on 16 May 2019. Author photo credit to Seth Hamilton.